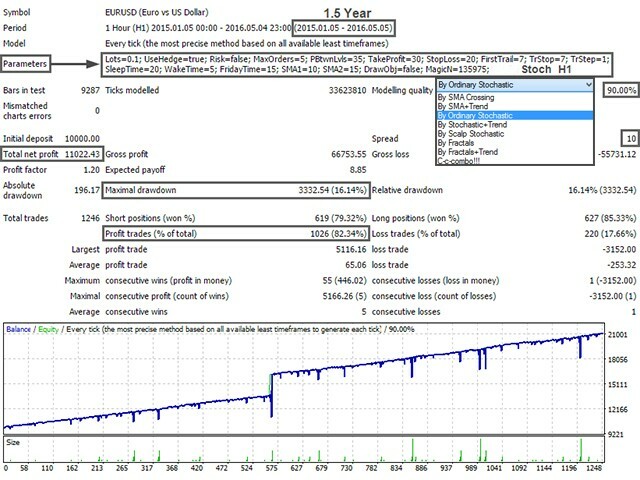 SmaRTDox is a fully automatic Expert Advisor based on the Martingale-style hedging strategy (see the graphics below). The EA works regardless of the price direction. 11 systems searching for entry points: SMA (+Trend), Stochastic (+Trend), Scalp-Stoch, Fractals (+Trend), Secret Strategy, Pin Bars, Impulse, Super Stoch. The robot does not change your orders. However, it features the option allowing it to pick up orders opened manually (Open first order manually). If you have your own strategy or you want to trade news, set Open first order manually to True. This allows you to open trades manually or place pending orders before important news above and below the current price. When one of the pending orders is activated, the robot deletes all the rest, while trailing the activated one or tracking it using a hedging strategy. If we re-launch the terminal or PC, the robot picks up all its orders and resumes from where it was stopped. You can also select the EA operation time. This is very useful if your broker widens the spread at night. Keep in mind that the robot does not open new orders outside working time. Instead, it only waits till the open ones (if any) are closed with profit and switches to sleep mode afterwards. If there are open orders using the hedging strategy, the robot opens new orders for supporting the strategy even in sleep mode. I recommend setting Finish on Friday to a dinner time so that the orders are closed by the end of a trading session. The EA has the control panel with the order fast open and close buttons. Currency pairs: EURUSD, GBPUSD, USDJPY. Deposit: $2000 and higher (or its equivalent in cents). Leverage: 1:500 – 1:1000. The larger the leverage, the better. Broker with a minimum slippage and spread. Broker that reduces the hedged margin (this can be seen in the symbol specification – Contract Size 100000 -> Margin Hedge 50000 or Margin Hedge 25000. The less, the better). If the EA opens the first order and the price goes to a profit area, it moves it to a breakeven depending on the selected First Trail (Breakeven), Trailing, Trailing Step settings. If the price moves the opposite direction, an opposite pending order with the volume of х2-x3 from the previous one opened at Distance between orders is placed – if the last open order is Buy, the pending one is Sell and vice versa. If both buy and sell orders are activated (hedging), the robot closes all orders when reaching a breakeven so that their total profit is positive (depends on Profit in breakeven zone in % in the settings – recommended values are from 5% to 20%). After closing all orders, the EA starts searching for entry points and the cycle continues again. Start Lot – lot size of the first order. Auto Lot - if True, the first order lot depends on the deposit size (the value is specified in the next fields). Increase Lot at 0.01 every - amount of funds, a lot is automatically increased by the account balance. Use Smart Hedge – smart hedging (main EA feature). Open first order manually – if True, the EA waits till the first order is opened, then tracking it according to its hedging strategy. If False, the EA works automatically without affecting your manually opened orders. 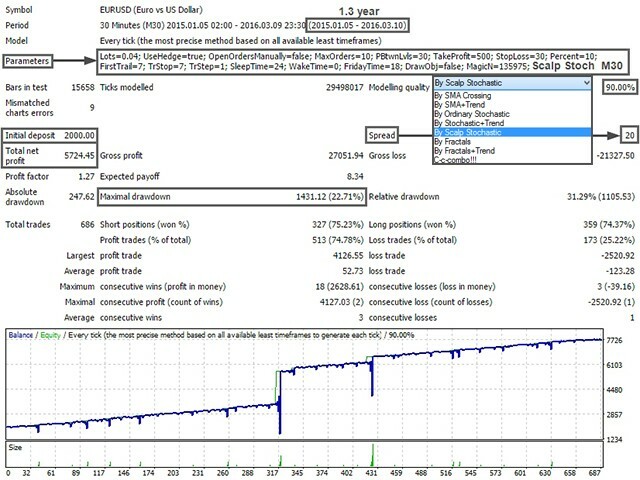 Max orders – parameter is used for a common trading without hedging. The robot opens orders every time an entry signal appears but not more. Distance between orders – distance in points between new orders. Take Profit – profit in points from an order open price (for "no hedging" mode or when the first open order becomes profitable immediately). Stop Loss – loss limitation in points (only for "no hedging" mode). How to increase lot - method for increasing a lot for order hedging - multiplication or adding. X factor for pending orders (*) – if How to increase lot is set to Multiply (*), a lot is multiplied by a specified value. Add to lot (+) - if How to increase lot is set to Add (+), a specified value is added to a starting lot. Profit in breakeven zone in % – distance in % passed by the price in the breakeven area to allow the EA close all positions. First Trail (Breakeven) – when an order should be moved to a breakeven. Trailing – tracking profit on a certain distance in points. Trailing step – profit tracking step. Open position – select the algorithm used to search for entry points. Impulse points – impulse strength in points (for the By Impulse strategy). 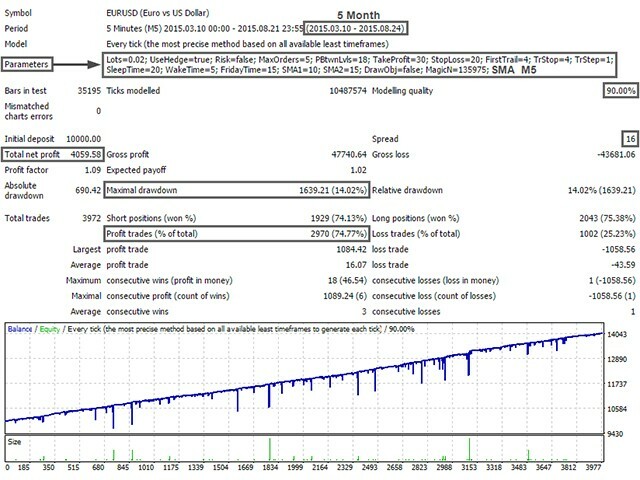 Timeframe for indicators – select a timeframe used by the robot. Use only extremum pin bars – define only pin bars that are maximums/minimums within a large time interval. Depth of pin bars in percents – ratio of a pin bar body and its wick. Maximum range – maximum pin bar height in points. Minimum range – minimum pin bar height in points. Use M5 ... H4 bars – if True, the robot looks for pin bars on this timeframe. Fall asleep at – robot switches to sleeping mode. It does not open new orders tracking only existing open orders. Wake up at – robot wake up time. Finish on Friday at – no new orders are opened after a specified time. Buttons Panel Corner – chart corner where the control panel is displayed. Draw objects on chart? – draw arrows and vertical lines when orders are opened. Draw Corridor on chart? – enable/disable filling the range between hedged orders. Corridor Color – range filling color. Draw Zones on chart? – enable/disable display of breakeven and profit lines. You can select style and color of each line. Play sound when all orders is closed – enable/disable an audio signal when all orders are closed. Magic Number – EA identifier. It should not coincide with other robots' IDs. Excellent adviser, I advise everyone! • added the ability to toggle setting take profit to the first order in a chain of hedged orders. • added the ability to move pending orders after the price. 1. Added control panel on the chart. There are buttons "Open Buy", "Open Sell", "Close Buy", "Close Sell", "Close All". a) By Impulse - catches sudden movements and open orders in the direction of a pulse. b) By Super Stoch - more accurate version of the stochastics, works very well on H4 timeframe. 3. Added the ability not only to multiply the volume orders, but also to add a certain value to an opened lot. 4. Added the ability to change the color and line style "Breakeven" and "Profit", as well as paint the range orders on the chart for a visual perception of the situation. 5. Another feature added which allows an EA be a bit safer and prevent the accumulation of a huge margin, first, by reducing the distance obtaining a profit when the maximum order limit is reached, second, due to the exhibiting TP of first open order in the pack of hedge orders. Thus, the order which can close a little earlier than everyone else, will be closed to reduce the margin on open positions. 6. Added a play sound options when all orders are closed. 1. Added the pin bar search system. 2. Added the ability to increase the lot for hedging not only x2, but also by any other value from x1.1 and higher. Fixed Errors 138, 130, 1. 1. Now, the EA is not afraid of delays in the execution of orders, we have improved the function of closing all orders. 2. Added the ability to auto-increase lot. 3. 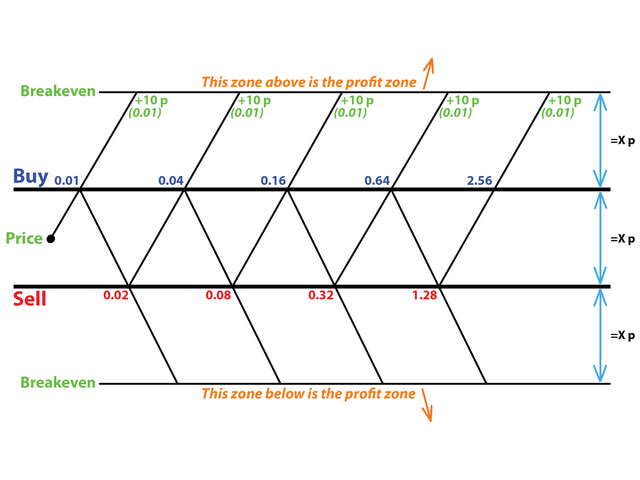 Added visual display of the breakeven zone and the profit zone on the chart. 4. Removed multiple arrows and lines. Now, only one arrow for Buy or Sell is displayed. 5. Removed unnecessary patterns of searching for entry points, added a few minor corrections. 6. Now you can trade the news - it is necessary to switch to manual mode. Place pending orders above and below the price and wait till they are triggered. As soon as one order is triggered, the robot removes the second one and follows the hedge strategy.